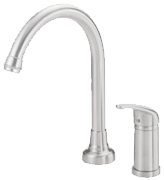 I made the decision to include kitchen faucets with separate spray for a number of reasons. The first is convenience. 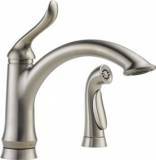 Not everyone likes the idea of a pull-down or pull-out faucet simply because it means pulling out a hose in order to either rinse your sink or do other jobs like cleaning vegetables. The second reason is aesthetics. If you take a look at the reviews below, you will see that I’ve done my best to show off what I think are the more attractive models on the market. The final reason I’ve included them is price! 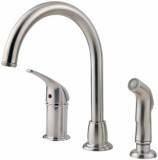 So, if you’re on a budget but don’t want to compromise on looks or convenience, perhaps the faucets below might be what you’re looking for.